Transform your style, customise and reinterpret t-shirts, jeans or sneakers with Giotto Decor Textile Creative expression to wear, special pens decorate any type of fabric and come in 8 classic and 4 fluorescent colours, all permanent and machine washable at 40° C. Water-based, non-toxic and safe, easily washable from hands, they come with a special fixed brush tip designed for fabric, safety and ventilated cap. Press with warm iron to fix colour. Black,violet, ultramarine, sky blue, green, neon green,neon yellow, yellow, neon orange, neon pink, red and brown. 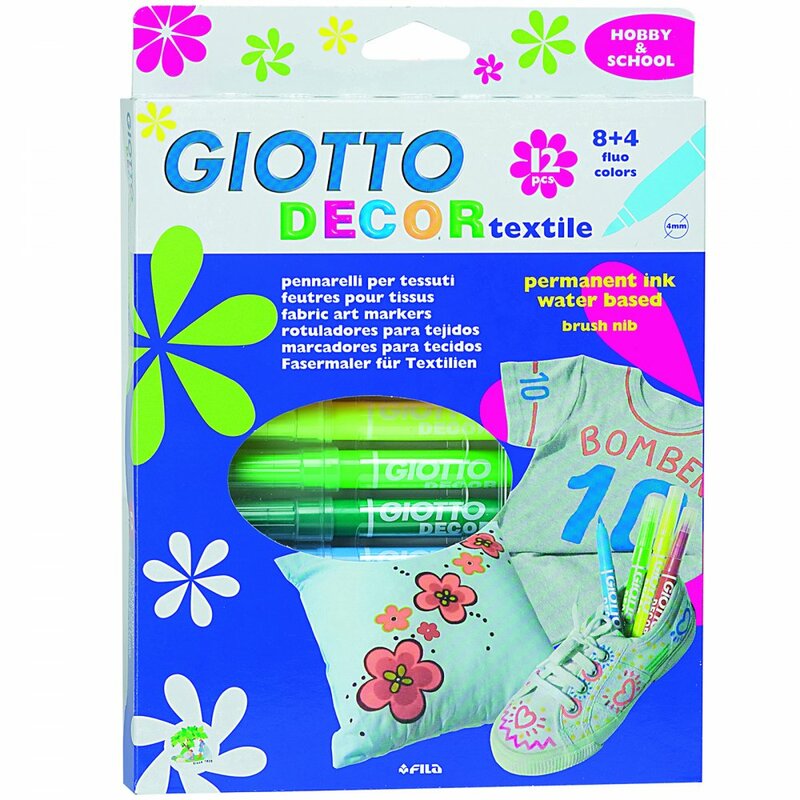 Showing 3 Fila Giotto Decor Textile Markers 12 Pack~ reviews. Average rating of Excellent. Would you like to write a review? Amazing. I was able to draw some quite fine details on my fabric. I almost bought these on amazon until I saw the great price here. I've been using the pens to recolour an old item of clothing which was suffering from fading and they are brilliant! Have had no problems with running or fading after using the pens. Would definitely recommend.